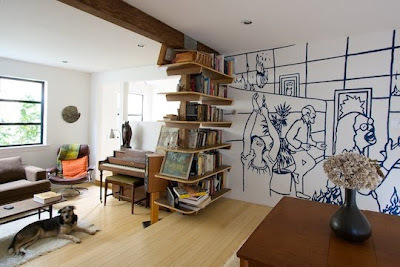 Jenny Jen42: Hmmmm....mural in the house time? Hmmmm....mural in the house time? Now that I have my house all to myself and have been turning painting ideas into installations....I stare at my blank walls of color all over my house trying to imagine the perfect line drawing, painting, text for each. Saw this on Apartment Therapy this morning and had to post it to remind myself that I can so this. Great house...good article on James Nestor's home ...read here.